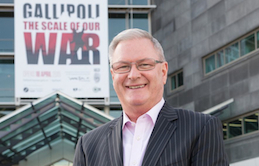 Gallipoli: The Scale of Our War is a ground-breaking exhibition from Te Papa and Weta Workshop. 776,000 visitors since opening makes it the most popular exhibition in New Zealand’s history. Commissioned to commemorate the centenary of New Zealand’s involvement in World War One, Gallipoli features hyper-realistic figures, two and a half times life size, as living monuments frozen in a moment of time, along with an array of stunning interactives. Te Papa and Weta collaborated with Wellington-based companies Locales, Click Suite, NV Interactive, Designworks, and Park Road Post, along with many others, to create the exhibit. Original generation time 3.9315 seconds. Cache Loaded in: 0.0389 seconds.